We love the children's book I Stink! by Kate & Jim Mcmullan about the stinky garbage truck. There's one line in the book that goes, "Go on, hold your nose." If there is an area in your house that makes you want to pinch your nose, perhaps you need the new Glade® Sense & Spray™ air freshener. 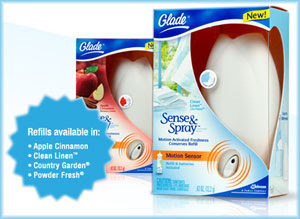 Glade® just recently sent me the Sense and Spray™ starter kit to try out in our home (MRP $8.99). It is an automatic air freshener that uses an intelligent motion sensing unit to detect movement. Unlike other air fresheners that continuously release fragrance, it sprays automatically only after someone has been in the room. This feature helps conserve the product. Additionally, once it has sprayed it goes into lockout mode and won't spray again for 30 minutes unless someone manually pushes the boost button on the front of the holder. The starter kit includes one holder, one refill and two AA batteries. The unit can be placed on a flat surface or mounted on the wall. We received the Clean Linen fragrance with our starter kit. The starter kit is also available in Apple Cinnamon fragrance and refills (MRP $3.49) can be obtained in the following four fragrances: Clean Linen, Apple Cinnamon, Powder Fresh and Country Garden. The refills last around 30 days depending on traffic. The unit was super easy to assemble. Basically all that needed to be done was to flip up the cover, snap the fragrance canister in place and remove a red tab to activate the batteries. It automatically sprays 20 seconds after assembly so make sure it isn't pointed at your face! At first I placed our Sense & Spray™ on our bathroom countertop. While it worked perfectly well in this location, I decided the Clean Linen scent really wasn't what I wanted in our bathroom. The smell reminds me of dryer sheets so I moved our unit onto a shelf in the mudroom/laundry area. This location has worked out perfectly for us. The room usually smells of dirty laundry and smelly shoes, but now the room has clean, pleasant fragrance. Once and awhile, after high traffic, the fragrance can get a little heavy since our mudroom is small and doesn't have the best ventilation. The unit doesn't include an on/off button so you can't turn it off completely. However, it is easy enough to pull out a battery or the canister to disable it. All in all, we've enjoyed the product. When my husband came home from work last week, he commented how much better the mudroom smells. The Sense & Spray™ must be doing it's job! The Glade® Sense & Spray™ is available for purchase in most mass-mechandise, drug and food stores. Glade has offered to giveaway (1) Sense & Spray Starter kit to a Brimful Curiosities reader. To enter, visit http://www.glade.com and leave a comment here telling me which other Glade product you'd like to try. • Contest ends on Monday, February 23rd, 2008 at 11:59 PM CST. I absolutely LOVE candles, but with so many kids in the house, it's just too dangerous. I'd like to try the flameless candles. I'd like to try the glass scents. I'd like to try the Glade Car Scented Oil. Cars get so stuffy, and I bet that would help! I've been wanting to try the Glade® Fabric & Air Odor Eliminator. I would like to also try Glade Glass Scents. I would love to try thier Glade Oil Scented Candles. I would love to try the Wisp Flameless Candle...especially with a 16 month old running around..I love candles, but I'm so nervous...this would be PERFECT! I would like to try out the oil scented holder for the car, I already use their other scented oil products and they work great and the car is one place I'd forgotten about. am now following your blog!